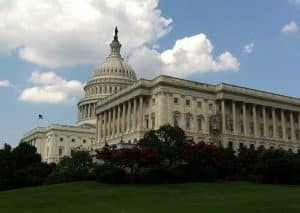 Home › Investing › What Is The Debt Ceiling? Every so often, you will hear the term U.S. debt ceiling bandied about on financial news networks. When the national debt issued by the U.S. Treasury approaches a limit previously set, the federal government is restricted from borrowing further. Fear of what might happen if the limit is not raised often seeps into the minds of investors, causing stock market volatility. But is the debt ceiling something you really need to worry about? Or is all the fearmongering an opportunity to buy stocks on sale? What Will The Next Decade Look Like? How U.S. Debt Affects You? The Debt Ceiling Is Reached? If the debt ceiling is hit before an increase in the limit has been enacted, the U.S. Treasury triggers “extraordinary measures” in order to finance government expenditures and obligations. In a worst case scenario, the U.S. could theoretically default on its debt if the U.S. Treasury uses up the financing for extraordinary measures. This fear of sovereign default is what causes investors to worry. A U.S. default would have far-reaching financial effects globally. As the global reserve currency, the U.S. dollar is the benchmark against which other currencies are measured. And the U.S. dollar is broadly accepted to be a safe haven currency – a place to store capital when the stock and bond markets are in turmoil. In the midst of a stock market crash, fearful investors flee to the perceived safety of the U.S. dollar. And U.S. debt in the form of Treasury bills, notes and bonds are backed the full faith and credit of the U.S. government. A default on U.S. debt would shatter trust and confidence of buyers in U.S. debt securities. And because interest rates are measures of risk premia, interest rates would likely rise significantly to account for higher risk levels. But what is the likelihood of a breach of the U.S. debt ceiling and a default occurring? When a debt ceiling limit approaches, Congress engages in verbal warfare with threats from both Republicans and Democrats, who each point the finger of blame at the other. Before agreeing to raise the debt ceiling, the parties attempt to persuade the other side to pass bills and push through other legislative initiatives. Raising the debt ceiling limit is a bargaining chip used by each party to get their own way on policy initiatives. Although a lot of posturing by party leaders takes place publicly, history shows that the Treasury has never reached the point of exhausting extraordinary measures. Congress often pushes the limit on making it appear like they would allow a default to take place, but they never have in the past. Public posturing eventually gives way to common sense and the reality that default would have far more serious consequences than failing to get some bill or other passed. But that doesn’t mean Congress isn’t willing to play a game of chicken when the topic arises. History shows debt ceiling crises are a recurring theme. The federal budget was not passed in 1995 and led to a government shutdown during 1995-1996 due to a standoff between Bill Clinton’s Democrat White House and the Republican Congress. For 27 days, two shutdowns caused the furlough of over 800,000 workers – which means they were put on temporary leave due to economic conditions. The government shutdown led to the curtailing of health services for military veterans, a temporary halt in disease surveillance by the Centers Of Disease Control and Prevention, a pause in the cleanup of toxic waste at over 600 sites, and the closure of 368 National Park sites. The fallout impacted over 200,000 passport applications and 20,000+ U.S. visa applications by foreigners, as well as tourism and airline industries, and approximately $3.7 billion in federal contracts. In 2011, the S&P rating agency shocked the world by downgrading the credit rating of the federal government after Republicans and Democrats failed to reach agreement over the terms of a deficit reduction. During the summer months of July and August, the Dow Jones Industrial Average fell by 2,000 points and in early August the Dow plunged by 635 points. Only a couple of years after the prior debt ceiling crisis, turmoil swept across congressional chambers again when the debt ceiling of $16.394 trillion previously set was reached on December 31, 2012. The U.S. Treasury was then required to take extraordinary measures to pay for essential expenditures and obligations. The crisis led to concerns that social security payments would be frozen along with other government contracts. Ultimately, Congress voted to suspend the debt ceiling in order to buy time to come to a resolution, which led to the debt ceiling being raised to $16.699 trillion. As Washington becomes ever more polarized, you can bet on each party promoting their own agendas in the lead up to the discussions to raise the debt ceiling again. And you can almost certainly count on the next debt ceiling crisis taking place. Over the next decade, the Congressional Budget Office (C.B.O.) projects that federal debt will grow by $10 trillion. One of the reasons the debt levels are spiralling higher is the cost to service the debt continues to grow ever larger. Interest payments on national debt are expected to double over the next 5 years according to the C.B.O. Over 200 billion dollars of taxpayer money went to service national debt in 2015 alone. The consequence of high national debt levels is a slowdown of economic growth, which in turn affects employment and income levels. Over the coming years, interest payments are expected to become an ever larger percentage of the federal budget. Doom and gloom sayers argue that trillions of dollars of debt will affect the U.S. dollar while many investors and economists argue that the debt-to-GDP ratio is a better measure of financial (ill-)health. According to the U.S. Bureau Of Public Debt, the U.S. gross federal debt to GDP has risen substantially since 2008. 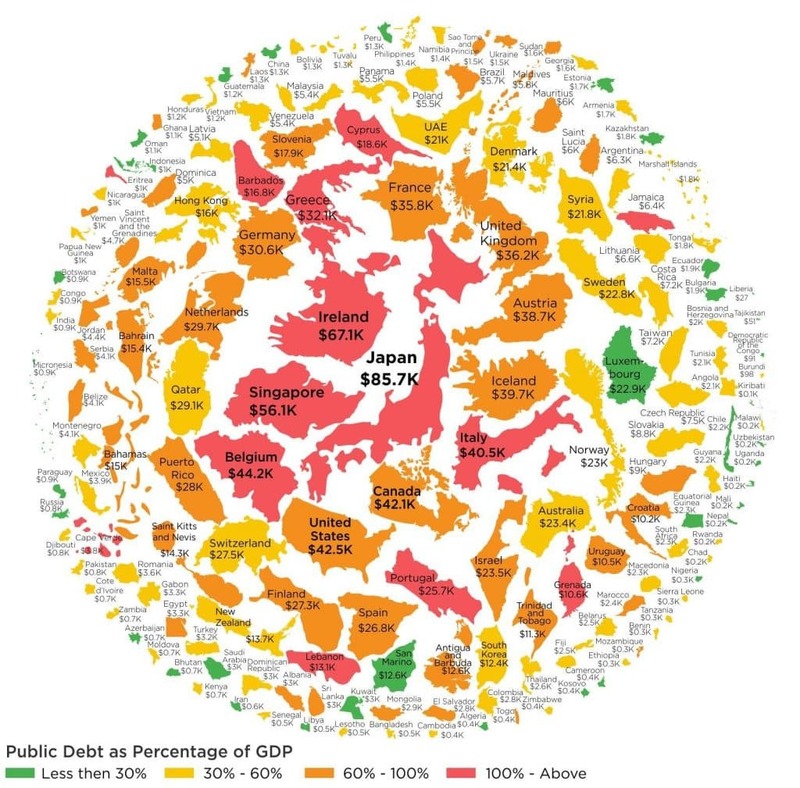 Debt now accounts for more than 100% of GDP, or gross domestic product – a measure of the total value of all the goods and services produced by a country’s citizens and businesses. Even if debt-to-GDP ratios don’t usually increase substantially from one year to the next, the absolute value of the debt is rising rapidly. As debt levels increase, the debt per capita or the amount each U.S. individual is saddled with generally increases too. As of 2017, each person in the U.S. was burdened with about $60,000 of national debt. While that is undoubtedly a large number, the debt per capita levels of some other countries dwarf it! Japanese debt per person is approximately $85,000 while the Irish are laden with about $67,000 per person. When public debt as a percentage of GDP exceeds 100%, it is generally perceived much more negatively because it starts to become unsustainable. Historically, when debt levels rise to excessive levels, currencies suffer. For example, you can see how the amount of silver in a coin steadily declined and then fell precipitously during the Roman empire as debt levels grew ever higher. When debt levels increase, they do so in nominal terms, so governments generally favor inflation because fewer real dollars are needed to pay the debt liabilities as time goes by – because the purchasing power of future dollars is lower than that of present-day dollars. As you can see from the above infographic, the debasement of a currency has been around since ancient times and is a common way for governments to tackle debt obligations. The big question in the future will be whether debt-to-GDP levels can be sustained and whether paper currencies like the U.S. dollar will be replaced by cryptocurrencies, or other means, just as the tally stick was replaced in the 1834 in the United Kingdom by paper currency. Are you concerned about U.S. debt levels? Share your views with us below. We would love to hear from you.